Searching for the best selection of men’s and women’s arch supports in Long Beach, CA? At Lucky Feet Shoes of Long Beach, we carry many over-the-counter arch supports the metatarsal support and without, to help reduce foot pain. Therefore, keep reading for a detailed list of some of the most supportive arch supports in Long Beach. Superfeet Green is an affordable, professional-grade orthotic that offers amazing support, performance, and comfort for anyone who wants their footwear to fit and feel better. The Superfeet Green is a firm, heavy-duty shock absorbing insole offers you maximum support while providing stability. Many of our customers with high arches prefer the Superfeet Green arch supports for the best hold on their arch when walking or running. In addition, this Superfeet Green features a hard plastic bottom that takes some time getting used to, but it’s an excellent shock absorber. This Superfeet Green is definitely one of the best arch supports in Long Beach. The Aetrex Lynco L2220 is designed to provide unsurpassed comfort and support in most footwear styles. This arch support features slow recovery IQ15 memory foam that customizes to the shape of the foot to help create a pressure-free environment in your shoes. In addition, a soft CopperGuard top cover made form state of the art copper fibers help prevent bacteria, fungi, and odor. Options include metatarsal support to provide additional protection at the ball-of-the-foot and medial posting to gently realign the rearfoot and control over-pronation. This Aetrex Lynco L2200 is definitely one of the best arch supports in Long Beach. 5. Lucky Feet Shoes without Metpad Lucky Feet Shoes Dress Arch Supports without Met Pad are a perfect ¾-inch arch supports that can easily fit into a wide range of shoes including athletic, casual, most dress shoes. They effectively support your arches and evenly distribute pressure across your whole foot. Their built-in foot arch support increases stability and reduces excessive motion; preventing your feet from flattening out and limiting pronation. In addition, they help minimize stress on your knees, hips, back, and feet; helping prevent flat feet and promoting proper body alignment. Overall, they were designed to provide unsurpassed comfort throughout your busy day. Just like the Lucky Feet Shoe without Metpad, the Lucky Feet Shoes Dress Arch Supports with Met Pad are a perfect ¾-inch arch supports that can easily fit into a wide range of shoes including athletic, casual, most dress shoes. They effectively support your arches and evenly distribute pressure across your whole foot. Their built-in foot arch support increases stability and reduces excessive motion; preventing your feet from flattening out and limiting pronation. The only difference between the two is the built-in metatarsal pad, which works great to target foot pain and adds additional comfort to most shoes. They help minimize stress on your knees, hips, back, and feet; helping prevent flat feet and promoting proper body alignment. Overall, they were designed to provide unsurpassed comfort throughout your busy day. This Lucky Feet Shoes with Metpad is definitely one of the best arch supports in Long Beach. METPAD- Built with a metpad for additional metatarsal support. This Berkemann Dress Orthotic with Metpad increases the wear comfort of your shoes in a simple and natural way by supporting the foot musculature. This orthotic is great for flat feet and fallen arches. It anatomically forms after the natural shape of your foot, supporting the longitudinal and transverse arches. It’s built with a shock absorber in the heel area that cushions your every step. Just like the Berkemann Dress Orthotic without Metpad, the Berkemann Full-Length Orthotic with Metpad arch supports increase the wear comfort of your shoes in a simple and natural way by supporting the foot musculature. In addition, they feature a built-in metatarsal pad, which works great to target foot pain and adds additional comfort to most shoes. This orthotic is great for flat feet and fallen arches. It anatomically forms after the natural shape of your foot, supporting the longitudinal and transverse arches. It’s built with a shock absorber in the heel area that cushions your every step. Aligns feet into the “ideal” position. Helps relieve joint pressure and pain. 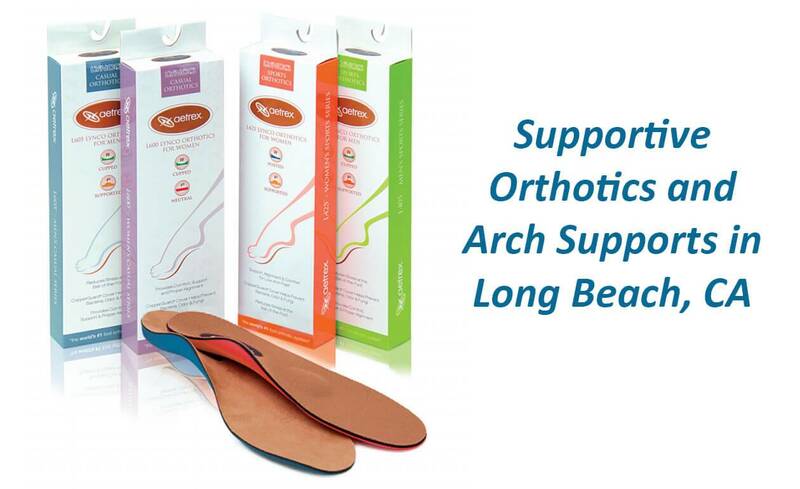 At Lucky Feet Shoes, we guarantee you’ll find supportive orthotics and arch supports in Long Beach. Lucky Feet Shoes of Long Beach is your one-stop-shop for arch supports and comfort footwear. Whether you prefer to shop online or instore, at Lucky Feet Shoes of Long Beach we have a large selection of over-the-counter arch supports. We invite you to stop by for a FREE FOOT ANALYSIS and find the best orthotics or arch supports for your needs.